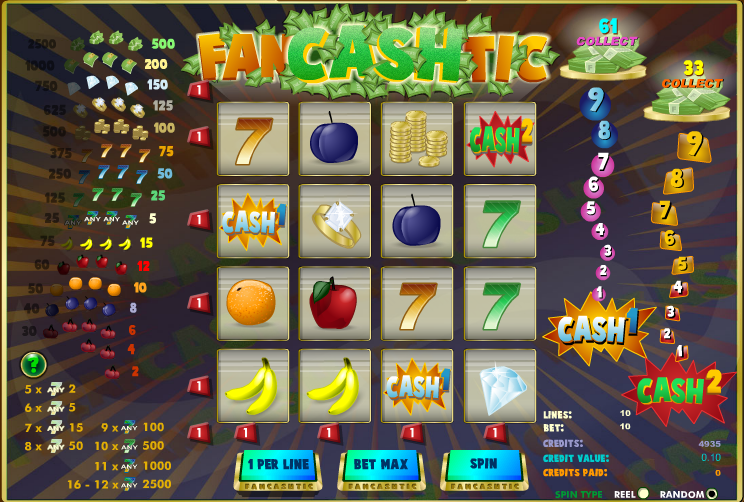 We’ve played many online slots over the years and consequently have come across some really tortured titles; FanCASHtic is probably the most awkward one yet though and not only is that the case, the gameplay is a little unusual too. This odd little game is from Amaya Gaming so read on to find out more. FanCASHtic is played on a 4 x 4 grid and it’s all about money; the most valuable symbols include piles of banknotes, diamonds, coins and other jewellery. The remaining symbols are mostly of the fruity variety and include cherries, oranges, apples and plums but there are also blue, green and gold sevens to add to the mix. There are two ways to spin the reels, the standard way and then a random way which shuffles everything around. You can choose between these methods yourself using the radio buttons in the bottom right hand corner. Wins pay horizontally and vertically and can run up, down and from left to right. The sevens also act as a scatter symbol and at least five anywhere on the reels will win you a prize. At least twelve on the reels will win you 2500 your wager. There are also two different coloured ‘Cash’ symbols which are relevant to the ladders on the right hand side. You will notice the two ladders to the right of the reels labelled ‘Cash 1’ and ‘Cash 2’; every time you land one of the orange or red ‘Cash’ symbols you will progress one rung up the respective ladder. The prize amount will increase each time you do so and when you eventually reach the top you will win that amount. If you keep playing you will win those amounts eventually. You will reach the accumulator bonus eventually and that’s always nice but don’t forget that the RTP to the player will remain the same however long you play. If you’re losing lots of money, don’t persevere. This is an entertaining enough slot which benefits from it’s sightly unusual gameplay. It’s hardly state of the art but it is worth a few moments of your time.